Oh, the power of Twitter. Last week, @OscarPRGirl, the prolific Twitter personality representing designer Oscar de la Renta, sent out a Tweet saying that Sophie Dahl had a recipe for a chicken stew with green olives that would "change your life." How could I resist a statement like that? Luckily, I happened to have Miss Dahl's lovely cookbook on hand (a gift from my amazing lit agent, Grainne Fox) and immediately flipped straight through to the recipe to jot down the ingredients I would need (which, incidentally, are few and easy to obtain). That very night, I whipped up the dish in my kitchen, and it is, indeed, life-changing in that it is something new and utterly delicious that I will make over and over again, especially through this cold winter. 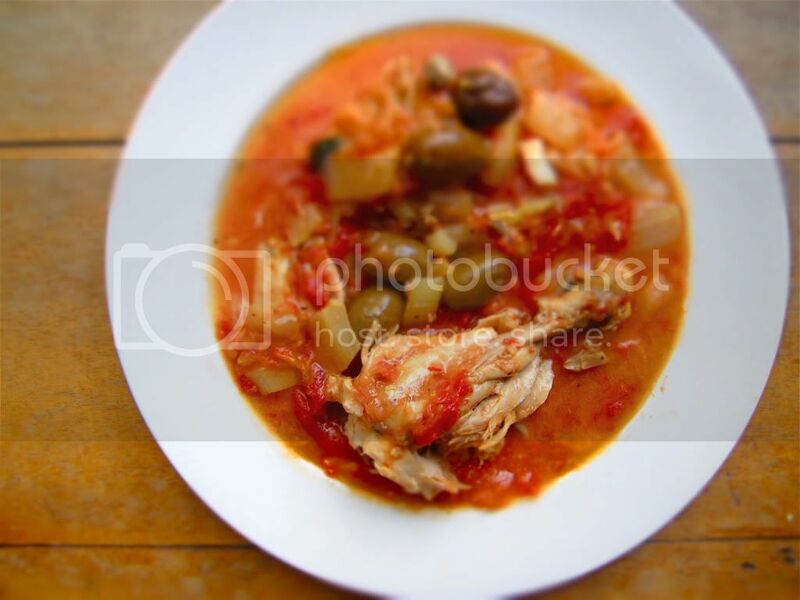 You begin with a whole cut up chicken that you brown first and then stew slowly in a fragrant mixture of tomatoes, fennel and garlic, a process that results in something in between a hearty chicken soup and a tomato stew. Whatever it is, it is savory and filling and gives one the feeling of eating something relatively healthful. And best of all, it's easy as can be to make. Go ahead and try it. In the words of someone very tasteful, "it will change your life." In a large pan, heat 3 tablespoons of oil and add the chicken, cooking until it has browned, about 8-10 minutes per side. You can do this in two batches if you don't have enough room in the pan. Just make sure not to crowd the chicken. Remove from the pan and set aside. In the same pan, sweat the garlic and fennel in a little more oil for a few minutes. Pour the wine over, add the tomatoes and cook for another 10 minutes on low. Put the chicken back into the pan and cook on low for around 30 minutes, adding the stock little by little. Put the olives and basil in at the end for a few minutes and serve. Green olives are my absolute favorite! This looks amazing! I made this last night and added gorgeous paprika from the farmer's market along with pequillo peppers and served it over polenta - heaven in a bowl.